26 December - A large Roman city has been uncovered in Romania, reports Popular Archaeology. Ulpia Traiana Sarmizegetusa's 2nd-3rd century AD layers are currently being excavated in what used to be called Dacia. Archaeological attention was focused on this site in the past, but only about 15% of the site has been uncovered so far. 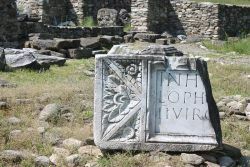 Archaeologists are returning in 2012 to learn more about the city and its necropoleis. I hope they find skeletons - Dacia produced a lot of slaves after they were defeated by Trajan in 106 AD, and I'd love to get my hands on some samples to test for Sr/O. Perhaps we could find out whether any of the people buried in Rome were originally from Dacia. 31 December to January 4 - There's been a significant amount of reporting about a high-status burial from an Etruscan cemetery at Montalto di Castro, near Vulci in Viterbo. Particularly interesting is the recovery of a sphinx dated to the 5th-4th centuries BC. Because of the rich grave goods, including the bones of a horse, archaeologists think the burial might be of an Etruscan prince. Only dignitaries apparently were buried with horses and armor. This burial is part of a larger necropolis of at least 37 tombs, but it sounds like only a handful of these tombs have been properly excavated. It'll be interesting to see what else archaeologists find as they excavate further at Montalto di Castro - clearly, the site hasn't been completely looted. Coverage of the find can be found at ArcheoRivista here and here, by the newspaper Il Messagero here, and in a cool video here. 4 January - In advance of the AIA conference, U Cincinnati graduate student Allison Emmerson got out a press release about her work on the tombs of Pompeii. Namely, she argued that the Pompeiians were perfectly ok living with trash - on their streets, in their tombs, near their cisterns. In the past, many archaeologists thought that the presence of trash at Pompeii meant that the city was collapsing, but Emmerson argues that it was just normal. 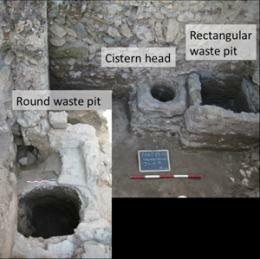 While Emmerson's work is interesting, she's not the first to suggest this - in particular, Lepetz and Van Andringa (among others) have been sorting through the layers of deposition at tombs in the Porta Nocera necropolis at Pompeii for years. You can read my notes from Emmerson's AIA talk here, and Katy Meyers covers it at Bones Don't Lie. And in case you missed it over the weekend, I blogged about my experience live-tweeting from the Archaeological Institute of America conference, including numerous papers on Roman and Greek bioarchaeology - Storified AIA Papers and Lessons from Live-Tweeting the AIA. Plus, you can also read a new review of the edited volume Roman Diasporas in the American Journal of Archaeology, in which I have two papers.